This graph shows the quarterly growth of the real GDP in the United States from 2011 to 2018. Real gross domestic product is defined as an inflation-adjusted measure that reflects the value of all goods and services produced in a given year, expressed in base-year prices. The U.S. GDP increased by 2.2 percent from the third quarter of 2018 to the fourth quarter of 2018. 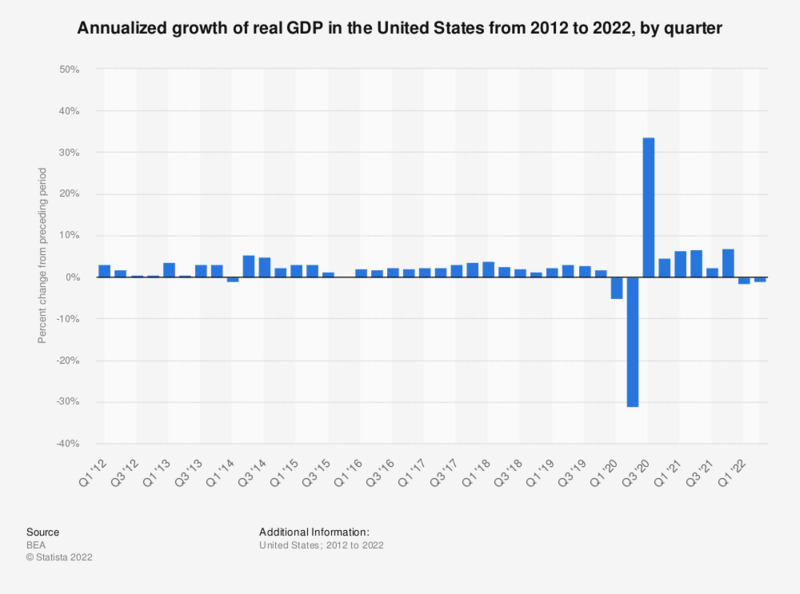 Overall, the US GDP increased by 2.9 percent in 2018, which can be found here. The real quarterly U.S. GDP growth in recent years since the recession has been mostly positive with some small exceptions. The GDP in the United States in the first quarter of 2009 experienced a 5.4 percent decrease. The National Bureau of Economic research dates the beginnings of the economic recession at December 2007. By 2009, the country’s GDP finally began to improve again, reaching almost 15 trillion U.S. dollars in 2010. In 2010, after the end of the recession, the global GDP increased by 5.38 percent. From 2019 to 2020, global GDP is expected to increase by 3.72 percent. Gross domestic product per capita has increased worldwide over the last decade (with the exception of 2009) and reached 10,150.79 U.S. dollars in 2016. As of 2017, Luxembourg had the highest GDP per capita in the world at 107,708.22 U.S. dollars. Still among the top ten countries in the world, the United States’ GDP per capita totaled 59,792.01 U.S. dollars. Data are seasonally adjusted at annual rates.